After a dreadful start to a season in which they have lost four of their first 10 La Liga games and dropped to ninth in the table, Real Madrid have sacked Julen Lopetegui. The identity of the man replacing him is something of a surprise, especially to outsiders. 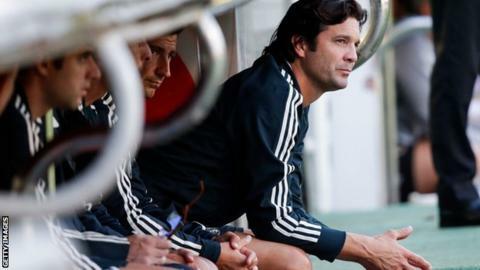 Santiago Solari is a relatively unknown figure even in Spain. However, Real’s announcement of Solari’s appointment made it clear he is only a temporary measure, and there is a widespread assumption that a better-known figure will be recruited before long. So what is going on at Real Madrid? Is Solari the new Zidane? Lopetegui’s fate was inevitable even before Sunday’s humiliating 5-1 El Clasico loss to Barcelona, and the widespread expectation in the wake of that defeat was that former Chelsea boss Antonio Conte would be the new boss at the Bernabeu. However, Conte has not agreed terms with Real president Florentino Perez, and with Lopetegui’s position clearly untenable the club have been forced to take a short-term emergency measure by promoting B team coach Solari. In many ways, there are strong similarities between the path trodden by Solari and his former team-mate Zinedine Zidane before the Frenchman’s appointment as manager in 2014. They played together for Real during the early years of Perez’s presidency, with Argentine winger Solari making 148 appearances for Los Blancos between 2000 and 2005, albeit often from the bench. Solari then departed for Inter Milan before finishing his playing career in his native South America, but he was lured back to the Bernabeu as youth-team coach in 2013 and graduated to become manager of the club’s B team – Real Madrid Castilla – in 2016, shortly after Zidane left that role to take over the first team. So now he is taking the exact same step as Zidane: a trusted confidante of Perez who played for the club in the early 2000s and later took charge of Castilla, before being elevated to the senior squad during a mid-season crisis. Does all this mean Solari is the next Zidane? In short, no. The similarities between Solari and Zidane – unfortunately for the Argentine – only go so far. For starters, Zidane had long been earmarked as first-team manager by Perez, with the Frenchman spending the 2013-14 season serving as an assistant coach to Carlo Ancelotti to prepare him for the bigger role at a later date. Zidane was also, of course, an undisputed legend – an untouchable icon who was fondly remembered as one of the greatest players in Real’s history, as well as a fine ambassador for the club with a charismatic personality that ensured instant and unquestioning respect from everyone around him. Solari is different. He was by no means a star turn during his playing days at the Bernabeu, and he is regarded by fans as “just another” former player rather than an all-time great. Unlike Zidane, he has never worked with Real’s first team – or any other first team – in a coaching capacity, and he has overseen mediocre results during his time with the B team, finishing 8th and 11th in the third-tier Segunda B division during his two seasons in charge. And although Solari is trusted by Perez, he is also something of an outsider. He played for cross-town rivals Atletico before joining Real, and has regularly expressed his strong admiration for Barcelona forward Lionel Messi – with whom he shares a hometown, Rosario in Argentina. While Solari occupied the relatively low-profile position as B team coach, the fact that he had frequently hailed Messi as by far the best player in the world didn’t really matter. But combined with his relative lack of status and total inexperience in senior management, it adds up to make him a less-than-convincing candidate for the role of Real Madrid manager on a long-term basis. When will a permanent replacement be appointed? Real have made no attempt to disguise the fact that Solari is only a short-term measure, announcing that he is “provisionally” in charge in a statement which also came down surprisingly hard on Lopetegui, lamenting the “great disproportion between the quality of the squad” and “the results obtained so far”. So how long will he be at the helm? The key factor is next month’s international break, which will give Perez a couple of weeks to secure the long-term replacement for Lopetegui before a busy period of fixtures which includes the remainder of the Champions League group stage, four La Liga games and the Fifa Club World Cup before Christmas. Another important factor in the timing of Perez’s next move is a Spanish federation regulation (Article 60, in case you were wondering) stating that provisional managers can only be in charge for two weeks, after which a permanent replacement must be named. Before then, Solari’s task is to guide his team through four games – Wednesday’s Copa del Rey first-leg trip to third-tier Melilla, league games against Real Valladolid and Celta Vigo, and a Champions League fixture at Czech side Viktoria Plzen. Those four fixtures may appear to be perfectly straightforward – but they are exactly the kind of games Real have been losing in recent weeks. Shortly before Sunday’s Clasico debacle they had lost three in a row to Levante, Alaves and CSKA Moscow. So nothing can be taken for granted, and the main priorities for Solari are to steady the ship, be sensible, restore the fragile confidence of the squad and just keep things ticking over before the permanent manager is named. The chances of that man being Solari are very slim. But the former Chelsea boss is playing hardball, with Marca reporting on Monday that he is demanding a long-term contract, plus the signing of a new striker and a new central defender – presumably to play in his favoured three-man back line. There is a serious concern that Conte will prove to be too much of his own man. Demanding to do things his way or the highway would not go down well with a squad who expect to be treated as respected equals – as they were by Zidane – rather than being strictly disciplined by an authoritarian coach like Conte. So perhaps the talks will break down for good, and Perez will have to look elsewhere. If Conte doesn’t budge Martinez would be a perfectly reasonable solution. But in the coming days we can also expect to see the (probably scurrilous) suggestion of a much more dramatic move: would Perez wait for a potential Jose Mourinho departure from Manchester United and take the opportunity to give the Portuguese a second spell in charge?